Mary Bitterauf and Titcomb Mountain manager Seth Noonkester. FARMINGTON - Local area kids will be able to ski at no cost at Titcomb Mountain next year, thanks to a donation in memory of two members of the skiing community. 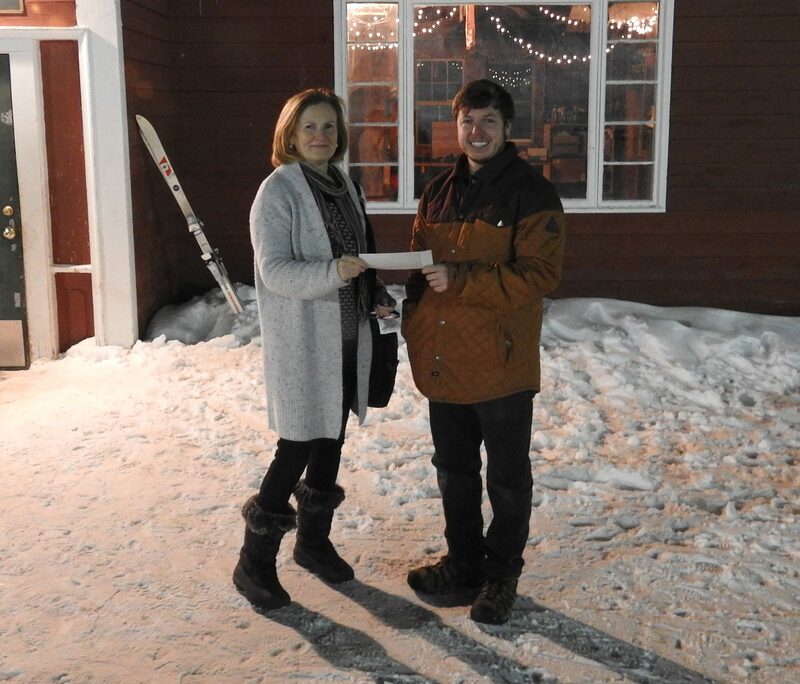 Mary Bitterauf presented a check for $1,000 to Titcomb Mountain last week, to be used to provide young people with ski lessons and equipment rentals through the mountain's Nana Webber Ski and Snowboard after-school program. The donation from the Nina Bitterauf Scholarship Fund was made in memory of Nina Bitterauf and Gordon Flint. Both individuals had close ties to Titcomb. Nina Bitterauf learned to ski at the mountain and was a member of the Championship Mt. Blue ski team. Flint was deeply involved in the operations of the mountain, serving as its treasurer for 22 years. The Nina Bitterauf Scholarship Fund has supported a number of local initiatives that benefit local area students, ranging from scholarships to professional programs for Regional School Unit 9 staff to equipment and storage facilities for gym classes at the schools. The fund also maintains "Nina's Woods" at Cascade Brook School, in collaboration with the Kirby Foundation. Nana Webber is one of several programs designed to instruct new skiers and snowboarders at Titcomb. It's a six-week program that runs through January and into February for students in grades 3 through 6. All costs for the students are covered through donations and grants, including lessons, rentals and lift tickets. Transportation is provided from RSU 9 schools. Anyone interested in participating in Nana Webber can contact Titcomb Mountain at 778-9031. Titcomb Mountain manager Seth Noonkester noted that the Titcomb was working on ways to provide transportation for all ski club members from local schools to the mountain. Another local initiative that has greatly benefited from the generous donations of the NinaBitterauf/Gordon Flint Scholarship, is a soon to be built gazebo at Cascade Brook School. The gazebo will be an addition to the playground, to allow fun accessibility for those with disabilities-the mission of the Fun For All Committee.Thank you Mary Bitterauf for your dedication in supporting community wellness! Today's young people are fortunate to be able to benefit from memorials which help us remember people like Gordie and Nina, who were so active in the community. Thank you, Mary Bitterauf, and all those who have helped provide these opportunities.